Thursday 30th October – Our faith is restored. Morocco we love you! We repacked all our treasures to make managing our luggage as easy as possible, said goodbye to Katy at about 11am taking a taxi to the train station. We are going to Casablanca to fly out because flights from there are cheaper and around four hours as a direct flight. 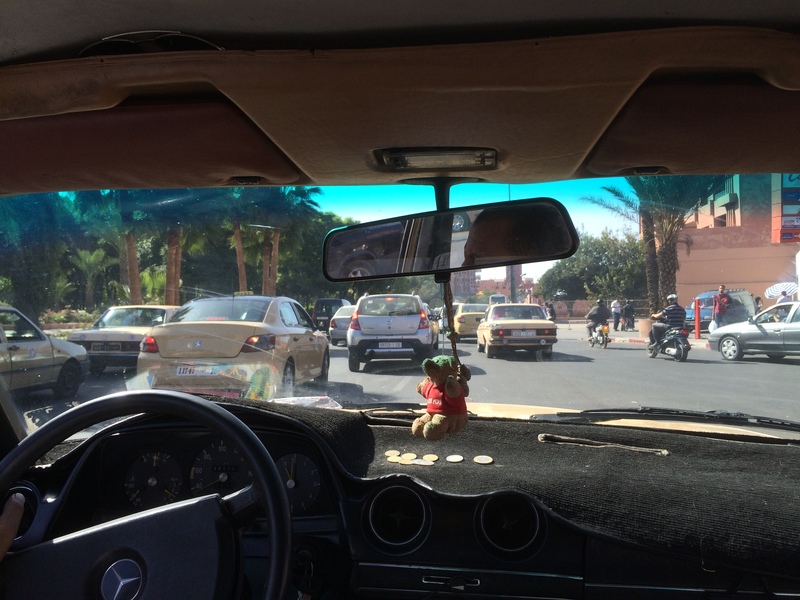 From Marrakech was more expensive and ten to twelve hours with plane changes. Still smarting from our pick pocket adventure, we are ready to move on anyway and the noise, heat and haggle accompanies our departure. We have bought first class train tickets as advised by Katy and as we make our way to our carriage and compartment, and then seat, we find there are two older ladies in our seats. They have our prime spots by the window, aircon and with the table. Gilbert says with a lovely smile, “excuse me, but those are our seats” they look at him as if they don’t give a damn and continue to talk to each other. Gilbert grabs the tickets off me to show them, but they feign disinterest and almost refuse to look at them. I’m in the alleyway with people trying to get around me with all our luggage and say to Gilbert “do we actually care. Why don’t we just get the luggage in and up and see what happens”. They make it clear they’re not going to budge without a fight and we decide we don’t care, so settle in the seats by the door that they indicate we have to sit in. Just before the train is about to leave, two more arrive. A young girl and her Mother and the four all share the McDonalds they have bought. The young girl immediately turns to us and offers her cheeseburger. How nice I think, but we decline, telling them we have just eaten. The girl turns to me after they have finished and asks where we have travelled from and we tell her our story. She is so lovely and friendly and she quickly introduces us to her Mother and her two aunties who are beaming at us now. They have been holidaying in Marrakech for a week and are returning home. The two who are in our seats are smiling and nodding as the young girl translates. I cheekily tell her they are in our seats but that’s ok. She has a broad smile understanding immediately that her aunties wouldn’t have given up their seats easily, talks to them and they all laugh. Her name is Meriem and she thanks us very much for letting them have our seats and offers us biscuits. She asks about NZ and I show her our family photos which they marvel over and say God is really watching over us. We must come to their house and stay with them. Meriem says her Mother insists. I tell her we have a hotel booked. No problem they say. Just cancel it. I’m keen to go but Gilbert says we can’t. They insist in that case that we must just come for dinner at least. Her Mother will cook couscous and other Moroccon treats for us and they don’t want to take no for an answer. I’m all ready to say yes, but Gilbert reminds me we have a hotel 30 km from the city centre by the airport because we have an early flight, so it’s not going to work. They are really disappointed and quite frankly so am I! Now I have introduced our family, she tells us she is working on her doctorate in biology. I hope I got that right. Between the three sisters they have four or five girls, all who are well educated. Seeing as we cannot stay this time then we must promise we will stay on our next trip to Morroco. We are of course welcome and we reciprocate by telling them they must stay with us if they ever come to NZ. We swap email contacts and once we arrive in Casablanca Meriem helps us get our tickets on to the airport before we all kiss each other goodbye. What nice people I say, as we settle where she has put us to wait for the train. I look at our tickets after a while and see the time has passed for the one I thought we were going on and so ask the young boy, who seems to be sitting by his Mother, if he knows when the next train to the airport is going, hoping they are perhaps going there too. He looks me up and down and ignores me like I’m scum. His Mother however leans forward to look at the tickets and growls at whatever he has said to her. She asks us to “please wait I will ask for you” and goes all the way back to the station to find out and returns with the time confirming we are in the right place. When her train comes she leaves us with a huge smile and says “yours will be next. Don’t worry.” Wow. That was so nice of her. Another two ladies sit in their place and pour coffees from a thermos. I watch their gorgeous little three yr old and smile at her as she’s staring at me. Her mum returns the smile and goes to hand me her cup of coffee. I say no thanks I am fine. Wow. Another super nice lady. Well that almost makes up for the little shits that stole the wallet last night I reckon. The airport train deposits us where we should be and before long a hotel shuttle whisks us away to the hotel we have booked online…and we don’t know why but we are upgraded on arrival and we’re not complaining at all! 2 Responses to Thursday 30th October – Our faith is restored. Morocco we love you! I forgot to say they gave me a bracelet with fatimahs hand the Turkish eye. Such lovely people. You’ll have to go there if you go to Morocco.